It was monsoon season but a dry day as the rains stayed away and so did the animals. I along with my friend Guruprasad visited the Bandipur Tiger Reserve. As usual we took the morning safari ride and drive into forest at 6:15am, I had kiran as my driver. The forest seemed quite dull as we drove most of the routes and covered a large tourism area and spotted nothing, except for few spotted deers (Chital). It is quite obvious that one can get frustrated and just pack off, however most of the times I don’t lose hopes until I am back in the resort and don’t even pack my camera till I get into my room, actions can happen anytime, anywhere. It was past 8:30am with no sighting of any animals we were heading towards the exit gate fully disappointed. 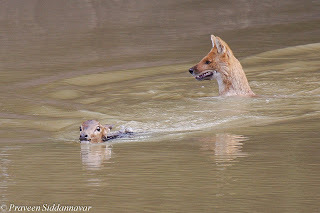 On the way back suddenly a small pack of 4 wild dogs (Dholes) made their appearance from no where, I asked kiran to follow the pack, I said to myself that I hope and wish we can see a kill. 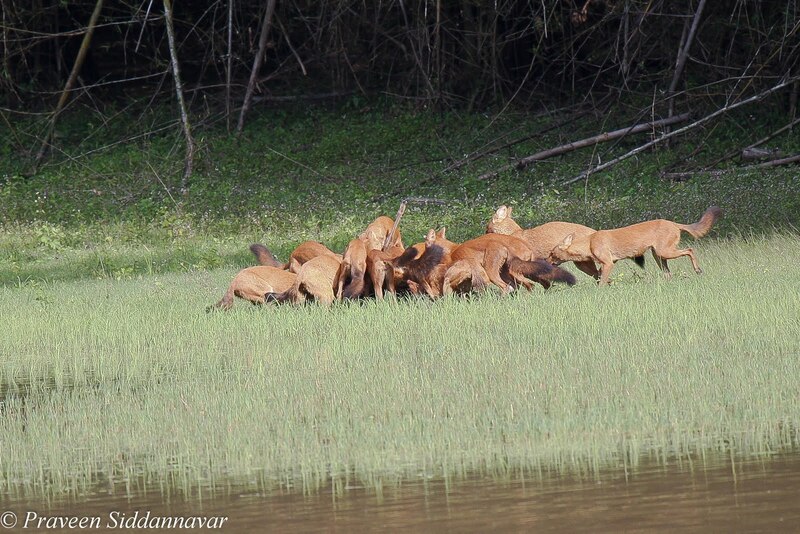 The pack of dholes were heading towards “Tavare Katte” the largest water body in Bandipur forest. 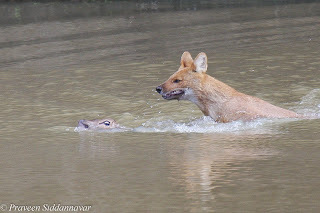 We noticed that the dholes were quenching their thirst; kiran immediately said “Sir the dholes are drinking water which means they have already made the kill and have come to drink water. I was not convinced, you may have the experience and would have spent all your life in forests, but sometimes you can still go wrong in understanding animal behavior. 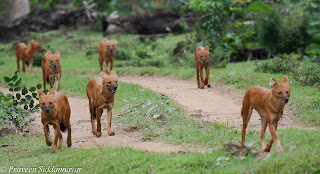 To me the pack seemed quite small; I have seen packs as large as 22 and as per the recent records at Bandipur there was no such sighting of a small pack of dholes. I was determined to follow the pack so requested kiran and he did oblige, it was getting late though. We followed the pack of dholes for few yards on the periphery of the water body; these dholes were towards our side moving here and there typically sniffing type of behavior as seen in dholes. We stopped the jeep at a point and there was complete silence. All we could hear was few birds chirping. It was a wonderful feeling to hear the melodious chirps of the birds for a change, else everyday I hear cars honking day in and out. On the other side of the water body I saw a group of spot billed ducks with chicks, since they were far and out of my reach, I didn’t want to photograph. Suddenly in this silent zone we heard alarm calls of a chital at a distance; the calls were loud and we were all excited with hope of seeing some action. I was ready with my camera patiently looking towards the other side of the water body from where we heard the alarm calls. To our surprise we saw a chital sprinting as if she was being attacked or chased by a predator, Indeed she was!, I couldn’t believe that a dhole – probably the alpha male was chasing the deer. 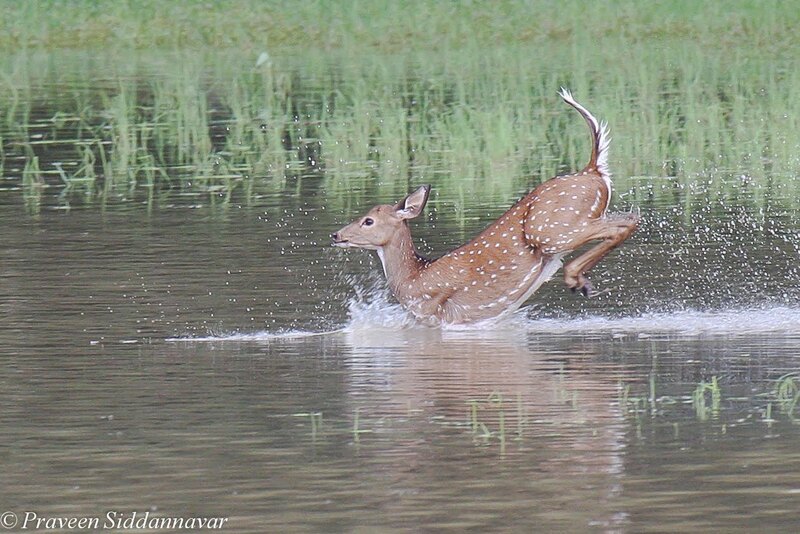 It was all so quick that I only managed to photograph the chital in action taking huge leaps but could not get the dhole in the same frame. The distance also was quite far over 200 meters or even more; hence you will notice that the quality of images are slightly on the lower side. 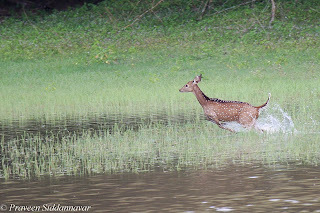 In state of panic and confusion the chital made a biggest mistake of her life, she took a long leap into the water, not knowing that it can be her death trap. 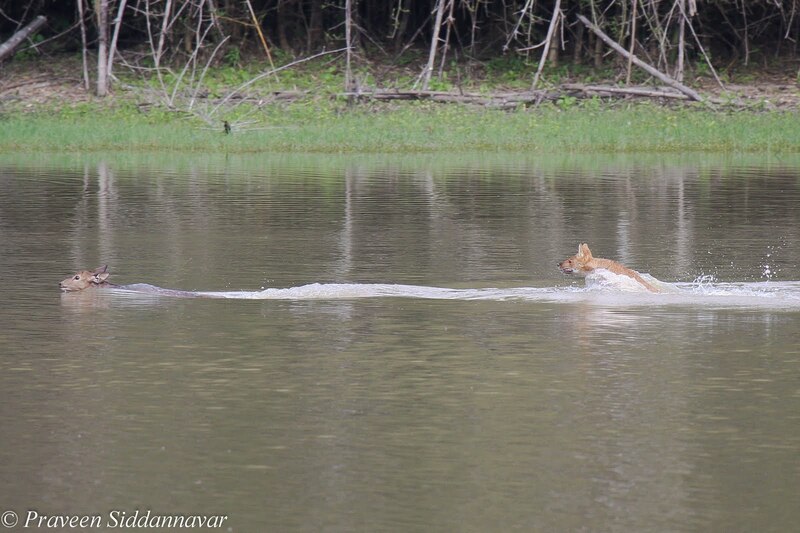 The raised tail of the chital indicates that she is alert and tells us the story; on the other hand the dhole chased her and also jumped into the water. Can you imagine "The Chase" in the water, Doles are opportunistic and excellent swimmers. 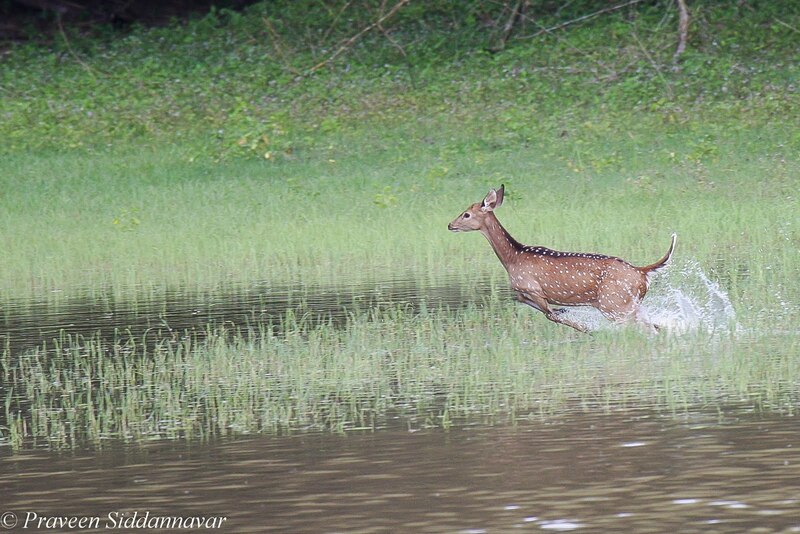 How can a prey like chital escape? My hands were shivering; I had never seen such an action before. This was quite disturbing but I kept my eye focused on the camera and my finger on the trigger. This is a very rare and natural history moment that I had ever witnessed. 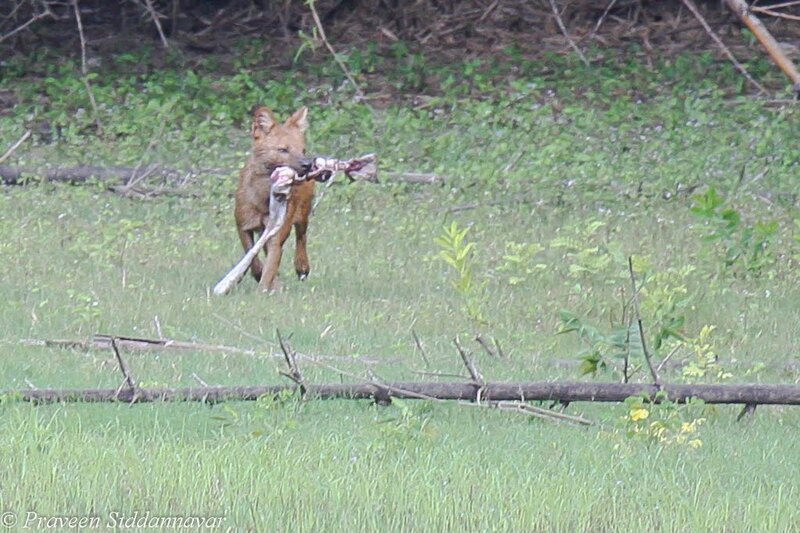 As the dhole got in closer to the chital, I could see the fear in her eyes, she calls for help. 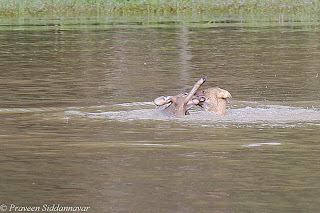 The spot billed ducks too were panicked and swam towards the shore. Obviously the chital senses danger to her life and continues to call for help. 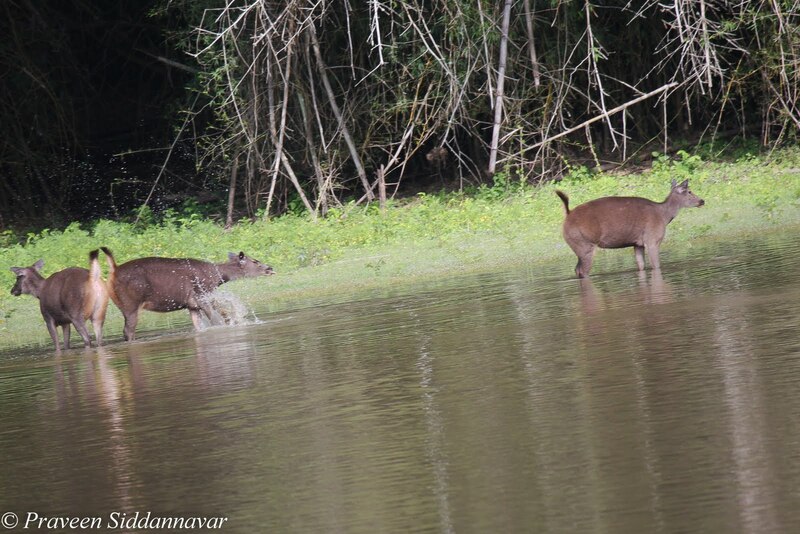 We were helpless and so were a group of sambar deers that had come to drink water on the other side. The wails (cry) of the deer were quite touching; I couldn’t control my emotions and had tears in my eyes. Even now I hear the echos and cries of the deer and I am sure the impact is such that this will keep echoing all my life. 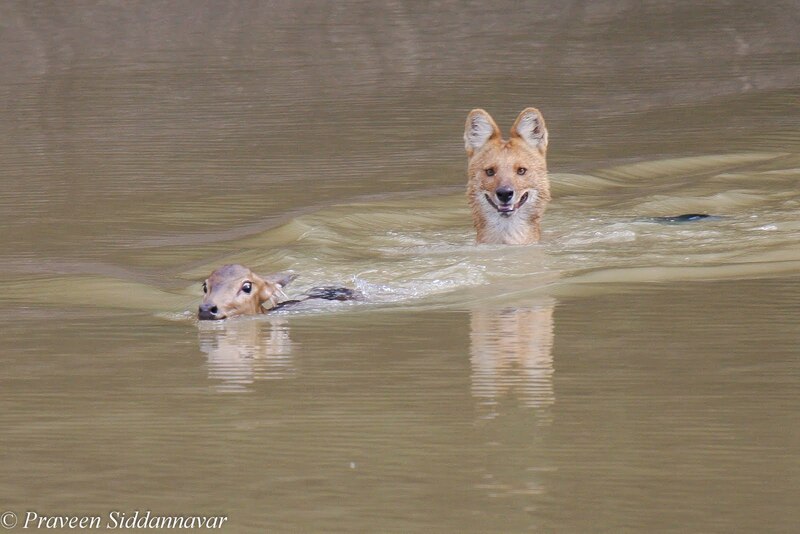 I think the dhole was on her back and tried to drown her by pushing her into the deep water. This was really disturbing but I continued to shoot. 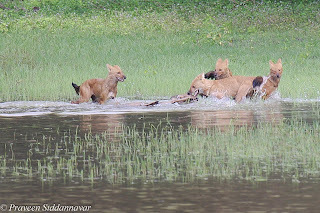 There was a moment when the dhole is temporarily got distracted and loses his focus, probably due to the group of sambar deers that were getting restless and kicking the water with their feet and also due to our presence. 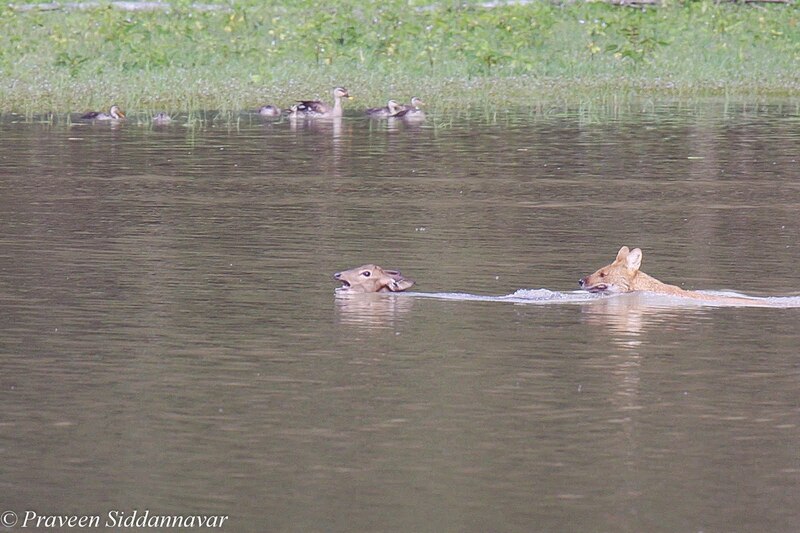 At first the dhole looks towards me, the face of the dog tells us he was confident and certain of victory; by then the chital that was about to drown swam up, the next moment the dhole looks at the sambar deers. 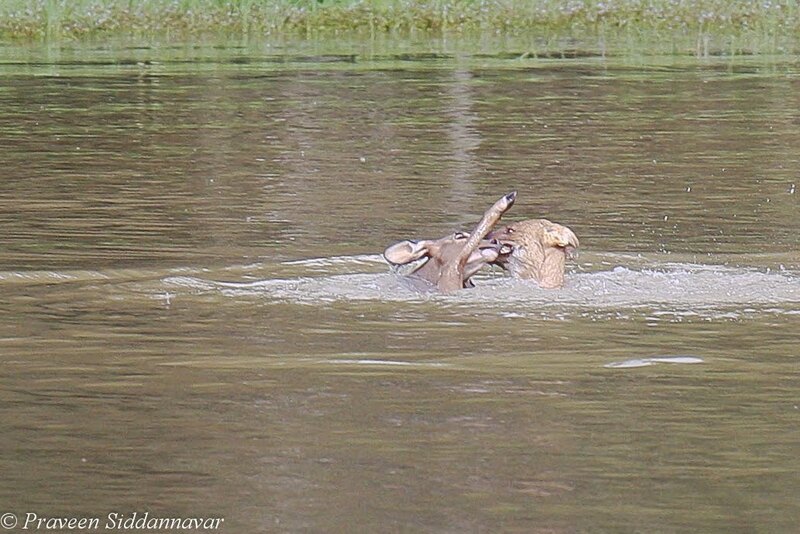 During this distraction the chital ceased the opportunity to escape and swims as fast as she can. She reaches the shore and is almost out of the water. As the chital swims towards the shore she notices another dhole charging at her from the right. 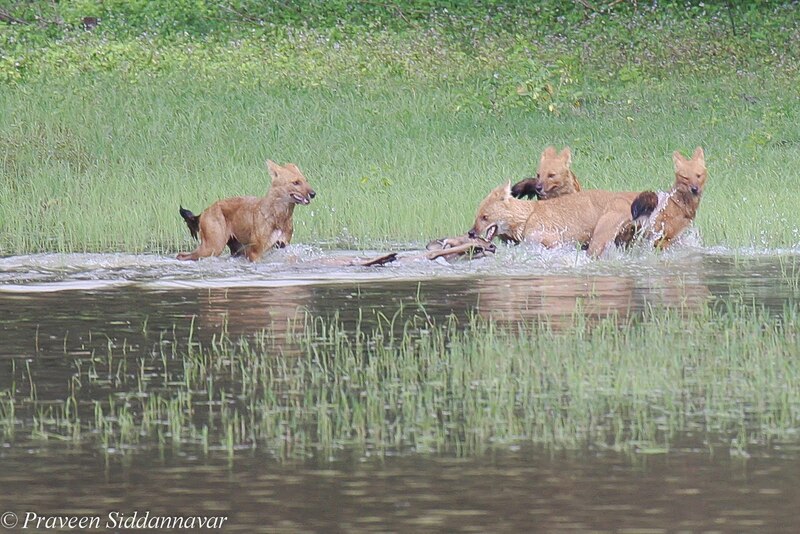 The pack of dholes had made an excellent ambush by surrounding the water body so the chital had no option but to jump back into the water. By now it’s been ~20 minutes of this high action packed drama, the alpha male decides to launch the attack, and the assault begins. 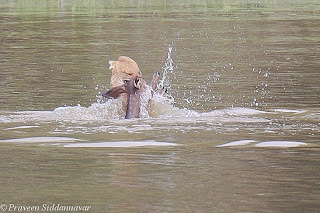 The alpha male makes the first attempt to bite the chital; she is in pain, tries hard to escape but now the dhole is fully in control. He pulls the chital towards the shore where the rest of the pack is already waiting. The pack of dholes launches a joint attack by giving painful bites and pulling out lumps of flesh. Death comes to chital by shock, exhaustion and loss of blood. All 14 members pack unite and begin to feast on the deer. The series of images tell you the fate of the chital. 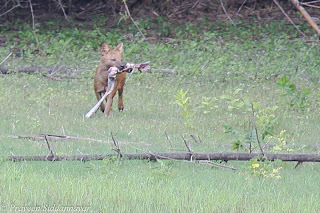 Unfortunate but a true story that clearly narrates “Life in the Wild” Finally one of the puppies from the pack also manages to get his share of the kill in the form of large piece of shoulder. This is other side of “Mother Nature” – in order for one has to live the other has to die. 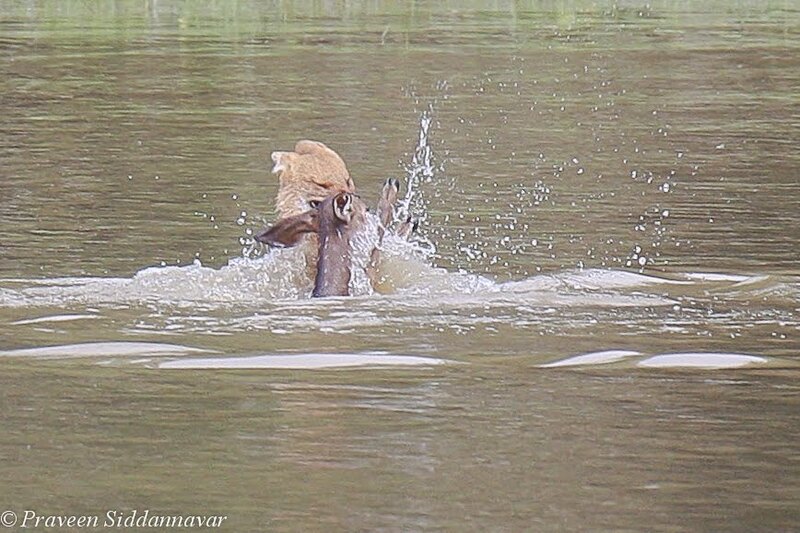 This was the most amazing moments of my life, Raw Nature at its best. p.s. Considering this as the most rare Natural History Moment in the wild. This photo story has been published in several leading wildlife magazines like Saevus Wildlife India LLP, India Travelogue and many more. 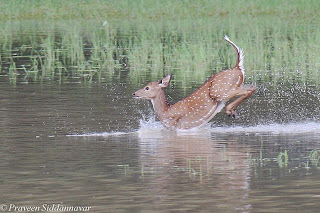 And the image #8 won several awards in 2012 that includes "Finalist" at BBC Wildlife Photographer of the Year 2012, Winner in Predators Contest organized by SAEVUS, "Special Mentions" at Sanctuary Asia Wildlife Photographer of the Year 2012, Raju Harkare Memorial National Level Wildlife Photography & Exhibition 2012 to name a few. This was a heart wrenching story and great pics! We met you this weekend at JLR. Great to have met you. The pics and blog are awesome. I have seen these pics when you posted it in Indiawilds.They are absolutely stunning.This is the first time Iam reading your blog.Wondeful write up.The experience of yours is truly amazing. Thank you for this amazing story. I'm sharing it on my Facebook profile. I wish to thank and congratulate you for your sensitive portrayal of the deer. 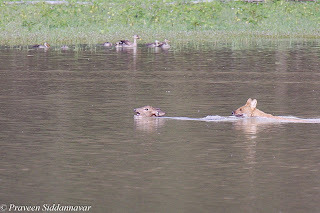 Unlike many people who would have relished at the gore and been dismissive of the deer as being a mere pawn in the cycle of life, you have depicted the workings of the minds of the ducks and sambhar with a writing skill that comes naturally with love and empathy. Thank you, again, for sharing this story, and also your photographs as freely. it was AS BAD AS BEING THERE Praveen ! I admire your emotions & the way you kept on clicking. Thanks for sharing this amazing story of life in the wild. I could see it unfold through your lens and description. Wish you more such experiences of the natural world. I've been following you on both FB and INW. Just cannot explain the creative and awesome photos..Enjoying to the core and very inspirational. Congratulations..! Beautiful write-up Sir and congratulation for the publication and awards.. wish many more of such to come in future.. Fantastic narration with excellent cliks. Worth publishing in National Geographical Magazine.